Internationally recognized as one of the worlds foremost quartets, the AMERICAN STRING QUARTET celebrates its 38th season in 20132014. Critics and col­leagues hold the Quartet in high esteem and many of todays leading artists and composers seek out the Quartet for col­lab­o­ra­tions. The Quartet has commissioned and premiered works by distinguished American composers Claus Adam, Richard Danielpour, Kenneth Fuchs, Tobias Picker, and George Tsontakis. 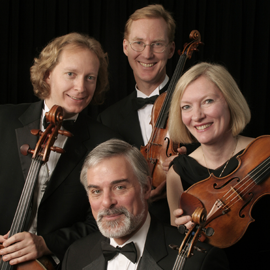 The Quartet has recorded numerous works on the Albany, CRI, MusicMasters, Musical Heritage Society, Nonesuch, and RCA labels, and their recordings of the complete Mozart string quartets on a matched set of Stradivarius instruments are widely held to set the standard for this repertoire. To celebrate its 35th anniversary, the Quartet recorded an ambitious CD, Schuberts Echo, released by NSS Music. The program invites the listener to appreciate the influence of Schubert on two masterworks of early 20th-century Vienna. Formed in 1974 when its original members were students at The Juilliard School, the American String Quartet was launched by winning both the Coleman Competition and the Naumburg Chamber Music Award in the same year. The Quartet continues as quartet in residence at the Manhattan School of Music (1984present) and the Aspen Music Festival (1974present).